Manager Roy Hodgson insists the Premier League will be Fulham's priority next season, despite the club qualifying for the newly formed Uefa Europa League. The Craven Cottage side finished seventh to confirm a spot in Europe. But Hodgson said: "It will be about showing the fans how good this season has been by introducing them to some European teams. "But, most importantly, the decisive thing is going to be to prepare well for the next Premier League season." He added: "We then take Europe as a bonus that comes along with it." 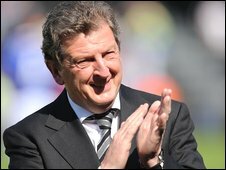 Hodgson has led Fulham to their highest top-flight finish on limited resources. He knows European competition will stretch his side even more but is looking forward to the prospect of competing in what was known as the Uefa Cup. "I think it's a blessing, you've got to rejoice in success," he added. "We're contemplating failure all the time so if you get a success - and it is no doubt a success, a very tangible one - I think we have got to be very happy about that. "We have got to take a realistic attitude towards it. "I don't think you can suddenly now start expecting Fulham to get together the type of squad the top four have because that's not the sort of club we are, we don't have that potential. "We've got to make the most of it and do the best job we can." Meanwhile, Hodgson has vowed to keep Norway international defender Brede Hangeland at Craven Cottage despite continued reports of interest from Arsenal. "We'll do everything in our power to keep Brede," he said. "Everyone knows he's a player that we love. He's still contracted to us and we want to keep him. "We're doing everything in our power - but our power sometimes can't be compared to the power of other clubs."